Preacher and teacher Michael Eaton takes us step-by-step through every book, chapter and verse of the Bible, with a short suggested reading and simple questions for every day. The book includes a flexible two-year reading plan. 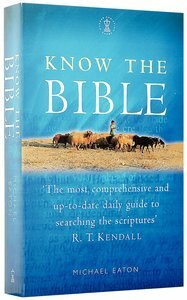 Know the Bible is a complete, one-volume study guide to the entire Bible, sitting alongside Alan M. Stibb's Search the Scriptures. Preacher and teacher Michael Eaton takes us step-by-step through every book, chapter and verse of the Bible, suggesting a short reading for every day, and simple questions to help apply the Word to the life we live today. The book offers a flexible two-year reading plan and draws on contemporary biblical scholarship. KNOW THE BIBLE is a remarkable achievement: a complete, one-volume study guide to the entire Bible. It will sit alongside - and offers a more relevant, up-to-date alternative to - Alan M Stibb's million-selling classic 'Search the Scriptures'. Popular preacher and teacher Michael Eaton takes us step-by-step through every book, chapter and verse of the Bible, suggesting a short reading for every day, and simple questions to help us apply the Word to the life we live today. How do we interpret the Bible today? How should we respond to its teaching? The book offers a flexible, two-year reading plan and draws on the most up-to-date biblical scholarship. With a Foreword by R T Kendall. Taking the reader step-by-step through every book, chapter and verse of the Bible, this guide suggests a short reading for every day over a two-year period, and simple questions to help apply the word to the life we live today. Michael Eaton has served as lecturer in Old Testament at Baptist Theological College of Southern Africa and is pastor-at-large of Chrisco Fellowship of Churches in Nairobi, Kenya. He is the author of numerous commentaries designed for ordinary people, the Tyndale Commentary on Ecclesiastes, and other books on the Atonement, Israel and Spiritual Gifts.